Well, after 36 hours sans iPhone, I find I have a lot of catching up to do. Seventy-seven unread e-mails, 199 tweets, 25 Facebook notifications, and I can't even think about Google reader. In some ways logging all this is an experiment because I was curious how much electronic information gets processed in a day. As for being offline, it made the day different somehow to set it aside--which is what I was hoping for. Not better. (I'm definitely not an anti-technology girl.) Just different. Now, I'm back in the land of the connected. I plan to start with Facebook. I missed you guys! We missed you too, Technology Girl! Happy Birthday! 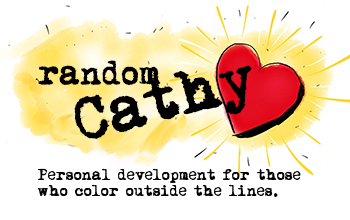 I didn't bother posting that yesterday because I knew you were out of commission ; ) I need a Random Cathy in the morning while I'm sipping my coffee and thinking about the day. Can we get a little more notice next time you decide to go offline?